SAMARKAND, September 3. /TASS/. Russian Prime Minister Dmitry Medvedev arrived in Samarkand to attend the funeral of Islam Karimov, the president of Uzbekistan. Russian President Vladimir Putin has instructed Prime Minister Dmitry Medvedev to head an official Russian delegation. According to the Prime Minister’s press secretary Natalya Timakova, the delegation also includes Russia’s Deputy Prime Minister and chief of the government’s executive office Sergei Prikhodko. Uzbek President Islam Karimov died on September 2 at the age of 78. Islam Karimov was born on January 30, 1938 in Samarkand, a city in eastern Uzbekistan. 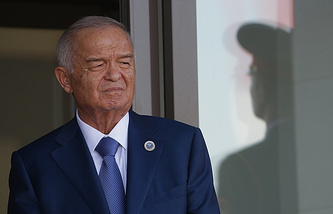 Karimov had ruled Uzbekistan since 1989, when he became the First Secretary of the republic’s Communist Party. In March 1990, he became the first president of the republic. In 1991, Karimov won the first presidential elections in Uzbekistan and served as president for five years. He retained his top post following nationwide referendums in 1995 and 2002, and after direct elections in 2000, 2007 and 2015. Karimov is one of the longest-serving presidents in the former Soviet states. He remained in power for 26 years. In addition, the president was awarded the title Hero of Uzbekistan. Karimov is also a doctor of science and an honorary academic at many educational institutions and establishments throughout many foreign countries. He is the author of books on Uzbekistan’s political and economic development. His works, statements and texts of his speeches were published in a ten-volume book.